Heidi Martikainen from restaurant Farang is the Waiter of The Year 2019! Heidi showed excellent technical skills in the competition and she has great customer service skills, but truly stood out with his confidence and comprehensive ability to give his customers a marvelous experience. He made excellent drink combinations to the dishes served at the competition. Waiter of the Year (Vuoden Tarjoilija) is the Finnish championship for professional waiters and waitresses. Competitors get to show their skills in practice, as they are serving guests with culinary delights prepared by semi­finalists of the national Chef of The Year contest held at the same time. The jury consists of Finnish and international members. The first Waiter of The Year competition was held in 2013 in Helsinki. 2013 – Maria Suihkonen, Restaurant Hullu Poro in Sirkka, Lapland. 2014 – Toni Yksjärvi, Gastrobar Emo, Helsinki. 2015 – Saara Alander, Restaurant Roux, Lahti. 2016 – Taneli Lehtonen, Restaurant Muru, Helsinki. 2017 – Ronny Malmberg, Farang, Helsinki. 2018 – Noora Sipilä, Restaurant Ora, Helsinki. 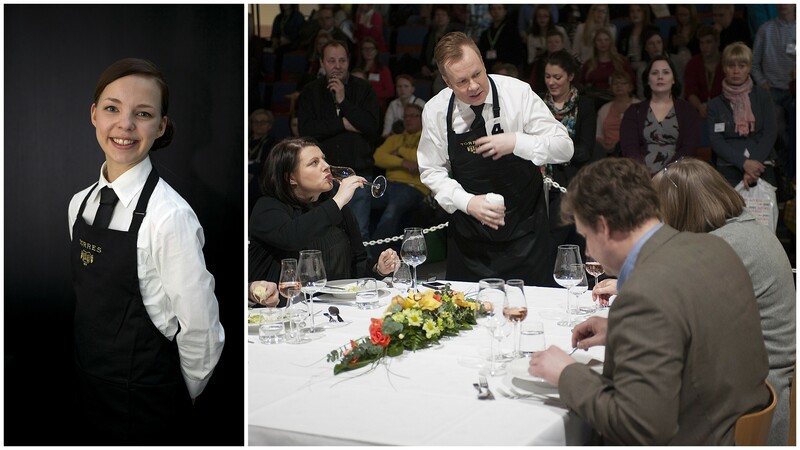 Waiter of the Year 2013 Maria Suihkonen (left) and Waiter of the Year 2014 Toni Yksjärvi (right). The ELO Foundation for Promotion of Finnish Food Culture is responsible for arranging the Waiter of the Year competition in Finland. ELO Foundation brings together food culture actors, visionaries and resources to co-operate for the good of Finnish gastronomy in Finland and internationally.